Learn about the top challenges inside sales leaders and reps are up against in 2017, and discover advice for overcoming these challenges. InsideSales.com, in partnership with American Association of Inside Sales Professionals (AA-ISP), recently released its annual research paper, “Top Challenges of the Inside Sales Industry 2016.” Here’s what you need to know. 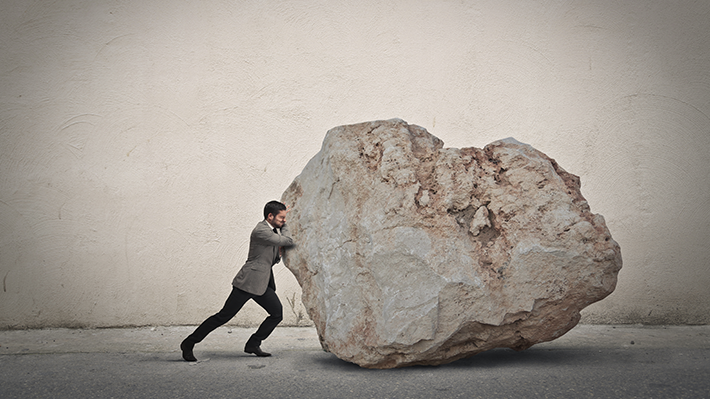 Sales reps are experiencing a substantial shift from the previous year’s challenges. Lead quantity and quality remains the top challenge by a wide margin, but after leads there’s been a complete reshuffling of the rankings. “Tools & technology” was the biggest mover, falling from three to ten. This trend suggests that sales teams are overcoming adoption barriers as they integrate modern tools into day-to-day activities. 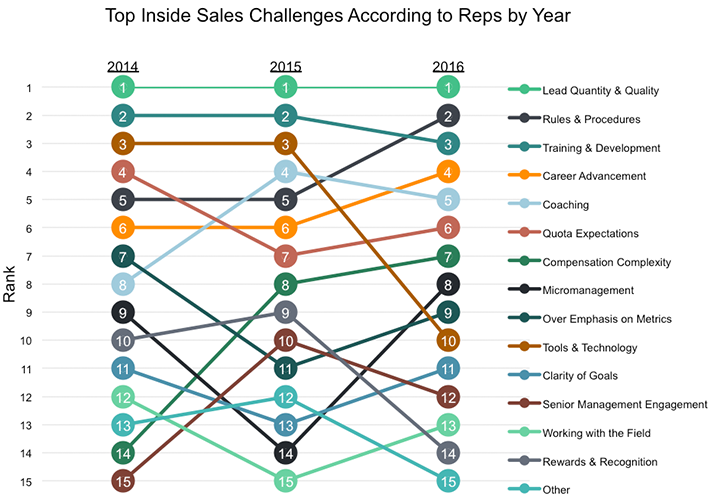 “Rules and procedures” shot up from five to become the second-ranked challenge among reps, suggesting that sales leaders are imposing excessive or unclear rules in response to a shifting sales landscape. 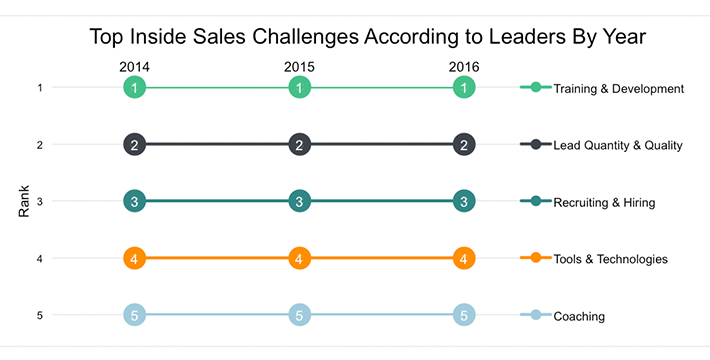 The chart below suggests an unchanged sales landscape for inside sales leaders. Will Change Come from Within? 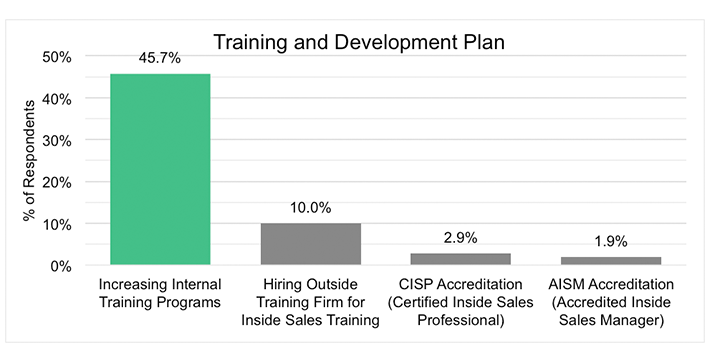 In response to the enduring training problem, InsideSales decided to ask sales leaders how they are solving the issue. Most have decided to look inward for answers. There’s no agreed-upon consensus for the “right amount” of rules and processes [JT1] for inside sales teams. It varies by industry and culture. 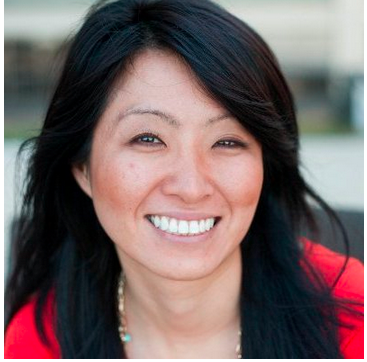 So how can sales leaders be sure to create rules and procedures that empower, not prohibit? One method is to implement a regular feedback loop that encourages open, productive communication. Another idea is to work with Sales Ops before implementing new rules or procedures as they can help you estimate productivity loss on certain activities. An ounce of prevention from Sales Ops can potentially save you thousands of hours in lost productivity. Ultimately though, the way to eliminate unnecessary rules, procedures, and switching from one model to the next is to help more reps achieve self-sufficiency. After all, if your reps’ actions get results, you won’t be hard-pressed to fix them. The answer, for nearly every inside sales leader, involves driving social media adoption in a way that helps sales reps yield better results over time. Conquer your top challenges this year with sales insights delivered to your inbox: Subscribe to the LinkedIn Sales Solutions blog.